My hubby thinks this is funny...what do you think? Who Are We Not To Be? "Our worst fear is not that we are inadequate, our deepest fear is that we are powerful beyond measure. It is our light, not our darkness that most frightens us. We ask ourselves, 'Who am I to be brilliant, gorgeous, talented and fabulous?' Actually, who are you not to be? You are a child of God; your playing small doesn't serve the world. There is nothing enlightened about shrinking so that other people won't feel insecure around you. We were born to make manifest the glory of God within us. It is not just in some of us, it is in everyone, and as we let our own light shine, we unconsciously give other people premission to do the same. As we are liberated from our own fear, our presence automatically liberates others." 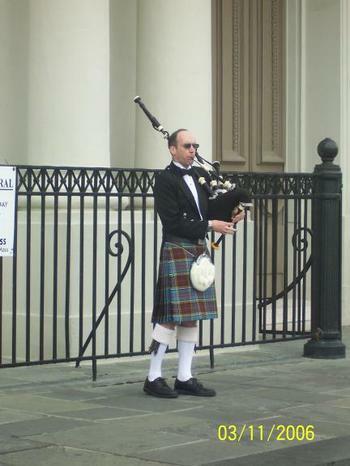 In my previous post I shared that we were witness to a few bridal parties in Jackson Square, New Orleans. When we decided to call it a day and head back towards the parking garage (9 blocks away) we were treated to a wonderful way to end our day in the city. A posting two days in a row, what will this world come to? LOL. 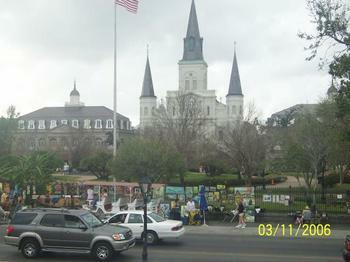 The weather in New Orleans on that Saturday was just perfect. We had a temperature of about 67F and a slight breeze. The sun was intermittent and the humidity was low. It was in this square and not far from where this picture was snapped, on a trip in April of 2000 that my hubby professed his love and committment for me and a future together. Standing there, taking in the sights and smells, I just closed my eyes and let the memories wash over me light a gentle breeze. The square is scattered with artist and musicians....a paradise for people who have an appreciation for sounds and sights. We learned that there had been 11 weddings just that day in this particular cathedral. They schedule them back to back and run a tight ship. Someone mentioned that they have 2 floors of the cathedral and hold weddings on each floor. We watched with smiles and good wishes while a bride had the photographer capture moments with her attendants outside in the square's courtyard. I've never seen a bride wear a headpiece with feathers so that was a first for me. Her dress was a beautiful champagne color and very tasteful. I have to interject a bit of bragging here...this picture is the very first time in more than 8 years that I have looked and thought to myself, "my weight loss is really beginning to show." 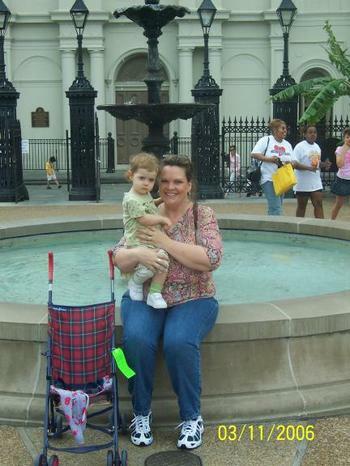 Since October 2004, I've lost over 62 pounds. What a pleasure to look at a picture that shows my full length and not think, "God! I'm fat!" I've got about 50 more pounds to go and that will come off just like that 62 pounds.....slow and steady, one day at a time. I was disappointed to learn that a bakery my husband and I had eaten at was closed and probably would not reopen...it sits on the very corner of the square. One can easily see the water line on most of the inside of this business. 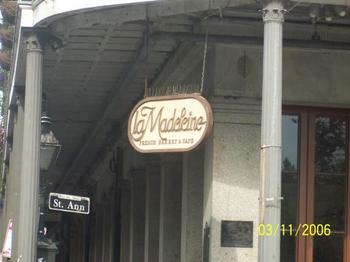 My fondness for this bakery was not only for the food but for the name....since it's the french version of M's name. A few blocks over we found the famous Bourbon Street - there's nothing changed about this street at all. 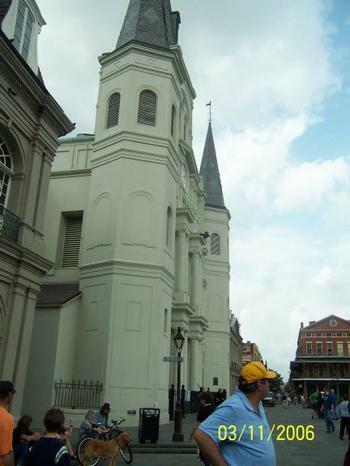 In fact, most of the french quarter and adjoining blocks bear no sign of the flooding or storm. If any of the landscape in the square was damaged, it has long been replaced and upgraded. I'll close this post with this picture above. She sits at the back of a rather long walkway near some public restrooms. She still wears her beads from Fat Tuesday. Her bronzed clothes and features are weathered with a lovely patina, similar to that of a beautiful woman tinged with specks of gray in her hair. 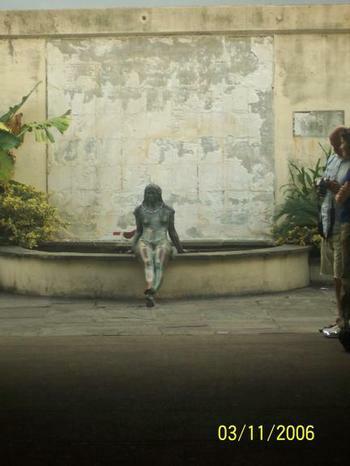 At first glance down that 30 foot tunnel - one might suspect that she's real (as in a human woman sitting there all alone pondering or feeling the mist of the fountain on her back) but upon closer inspection it's easy to see that she's just there for a tourist's visual pleasure. Pleasure......that's what that whole day was for me.....a source of pleasure. 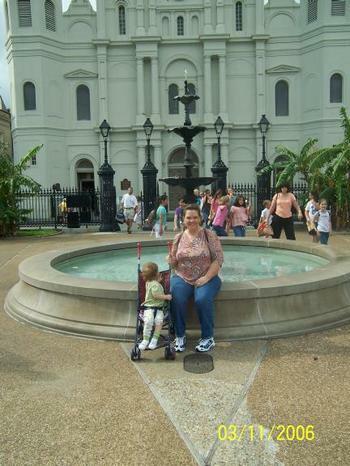 Our trip to Louisiana was more than memorable - it was fabulous! My goal is to share a few images/stories each day. 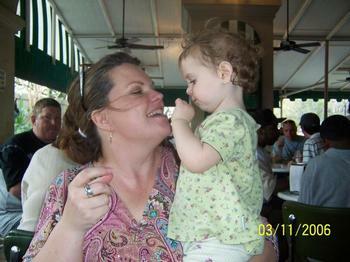 Baby K and I flew out of Atlanta on Friday (3/10) mid day and arrived in New Orleans in early afternoon. I went to see my extended family member (EFM). She's actually my mother's younger sister; however, I consider her more like my sister as well as my favorite family member. She and I share a very special and unique relationship that I value closer than others. Her hubby stood in as our chauffeur for the day and carried us home from the airport. They live in Baton Rouge so we had a bit of a drive home from the airport. It is not untouched. Neither am I. Houses and building still remain with blue tarps and half of roofs missing. White F*EMA Trailers scatter the properties like strewn trash after Mardi Gras. Speaking of trash, in over 70% of the places that I saw, THAT is their main problem - trash and debris. It looks as if they have about 3 weeks of constant pickup that needs to occur. The construction contents of people's homes are pushed out into the street. 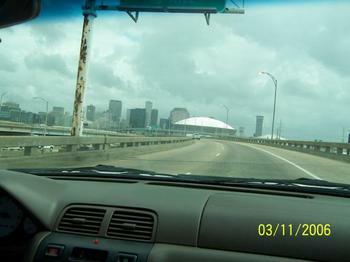 We didn't go into New Orleans proper until next day, Saturday. 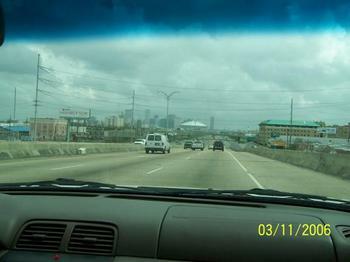 Once we got into the actual New Orlean's area (after getting lost taking a driving tour) of some of the more devastating areas that still are not cleaned up, we found our way downtown. We had lunch at Maspero's. I feasted on the contents of an oyster and shrimp Po Boy (left off the bread) and about a liter of cool water. 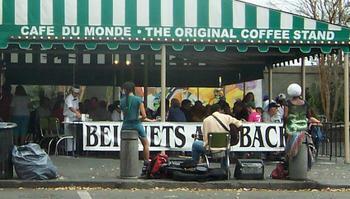 If you've never tasted a Beignet from Cafe Du Monde...then you simply ain't lived yet. 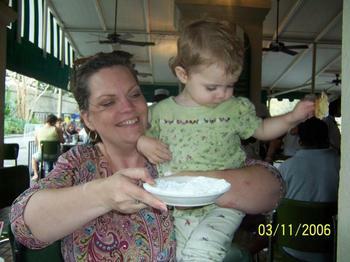 We had such fun at this place....Baby K got a taste of the beignet and then the powdered sugar.....then the *fun* began :) That's EFM holding Baby K.
She liked the way the powdered sugar tasted and once she saw us dip our beignet in the sugar, she had to do it too. Then she wanted to "feed" us. The beignets are such a priceless taste and I was concerned that she'd drop hers on that nasty floor covered with layers upon layers of sugar and dirt..... I was praying that my shoe would unstick with each and every step I took. 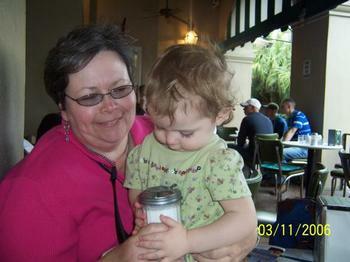 About 2 seconds after this shot above was snapped, Baby K swiped almost the entire plate of sugar onto my chest and lap. Then she proceeded to laugh her head off and pose for the camera. When this picture was taken I was laughing so hard I almost fell off the chair into all that sugary grime on the cement. I can still hear us laughing at her and at the woman next to us who tasted chickory coffee for the first time in her life. I can safely say that she won't be lining up to taste it again. The look on her face was priceless. We were sufficiently satisfied from that sugar load...My Lord! those things are good.....and walked a block over to the bridge way that looks out one way to the Mississippi River and another way to Jackson Square. Next we ventured into the square and all the little shops and boutiques that line the square. I'll share pictures of that (plus more) tomorrow, I promise. I'd like to share the following heartfelt true story with you all. I began my journey with BeautiControl in April 1989. A few weeks after I joined there was a police office gunned down in a bus depot parking lot in front of a crowd of people in the town where I was born/raised. The gunman shot him point blank behind the ear. The policeman left behind wife, a 2 year old daughter and a 3 week old son. There was something about that story and that woman that tore my heart apart. I prayed for that woman each and every single time she crossed my thoughts during those days/weeks. I even thought several times about contacting her to let her know that her story had touched me so. The 3rd image clinic (back when that was what we called our parties) that I ever did was in a subdivision in Savannah, GA and had 5 women present. I had almost not gone to do that clinic because I felt intimidated at the wealthy homes and with it being in a ritzy part of town. I kept waiting for the hostess to back out of it or for some reason to come up so that I could get out of going to do it. I was afraid. I'm not sure of what but it was something. I wanted to not go that night; however, something in my heart told me to go. I prayed about it and asked God to make it worth my while and help me not to be so nervous. I was brand new and still "green" and didn't know what I was doing. The women there were gracious and enjoyable....and there was conversation about the murder....I just commented before those women that my heart had been greatly moved by that story and if I were able, I'd give that widow a huge big hug and let her know that I'd been praying for her for weeks almost hourly. Imagine my surprise when one of the very quiet women spoke up and said, "I really appreciate that. I'm that widow." (I have goose bumps typing this out) I was totally speechless and felt the tears well up not only in my eyes but in my heart as well. We both cried and so did all the other women there. Would you believe that none of those women became clients of mine and I can't even remember the names of any of them? I just know that THAT (meeting that widow) was why I was supposed to be at that image clinic. BC was to be used as a ministry to her and to me. That woman grew over the next few months to become part of my inner circle of friends and over the past 17 years has consistently been my very best client in sales. She has ordered over $4K from my website alone in the past 3.5 years. She has sent me clients and our friendship has continued to deepen. She is the very reason that I never went inactive and dropped out of BC - because I couldnt afford to give up the profit that she alone afforded me. We've shared many things, including the sudden death of my pregnant sister on March 25, 1991. 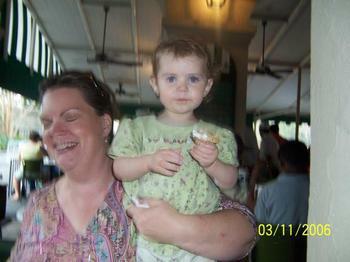 Seven weeks later my daughter was born and Joan was there as my friend. She was with me when I remarried my current hubby. I was there when she finally found someone to call a mate after living as a single mom/widow for over a decade. She met him on the internet and everyone in her family tried to discourage her. I said trust your heart...look where it got us. She stayed behind in our old town when I married and moved here and I cheered her on when she married that man she met on the internet and moved to TX three years ago. All that to say that BC changed our lives - both of us. Each year when we've had a promotion, I've offered her the opportunity. She has always said,"Thanks, but I don't think so." She continued to order products and receive numorous compliments on her beautiful skin. She sent me those people and they became my long distance clients. She uses everything that we have. Yesterday I spoke with her again. We were having trouble connecting & it's been over 7 months since we've actually spoken on the phone. We got caught up on our kids/families and the conversation turned to my re-committment to grow my business and earn the money that will make a difference in our family's needs. I shared with her my experiences and the income of $2500+ that I've been able to earn these past 6 weeks but more than that - how much FUN I'm having while I'm meeting new people. I conveyed to her that I promised that I would keep offering and inviting until she flat out told me to not ask again. So I offered and told her about how much she would have saved had she been buying at a consultant discount. She actually told me that she 'had been thinking about it' and took my call as a sign and answer to prayer that she needed to think further. I encouraged her to visit my webpage, look around & ask me some questions. She called on her way home from work to ask a question that her hubby had about the business. I answered it and told her that if I didn't hear back from her by Friday that I'd call her. Imagine my absolute gratitude and delight when I looked just a minute ago on my leadership screen and found her name as my newest consultant on my TEAM. I just sat there and said another prayer of gratitude for her, her friendship and now what will become our professional relationship. I planted that seed in May 1989 and I've fertilized it every year patiently. Now I get to watch it mature. The bloom is peeking slightly, teasing me with the possibilities.....not only for her but for myself as well. Anyhow, I just wanted to share that sweet story whose timeline spans 17+ years. Man Alive! Gosh Darn! Gee Whiz! I didn't realize it's been weeks since I last posted. My apologies to those who are waiting with baited breath to hear all that's been going on in my life. My trip to Baton Rouge/New Orleans was absolutely FABULOUS! I have lots of pictures and details to share. My flowerbeds are just beautiful and revealing more and more surprises each and every single day. Did you know there was such a tree as a "winged Elm"? Me neither until this past week. My hubby is writing lots and lots of music and traveling a bit in between with judging concert large group performances. All of my children are doing wonderfully - even the ones that aren't with me 24/7. My dad's health is improving (he was here just this past weekend for a few days). My MIL is half way through with her radiation treatments and tolerating them well. Weather permitting - we get our new roof the end of this week/beginning of next week. The grading and sodding of the ragged edge of our yard begins the week after that. More details and pictures to come later this week. Stay Tuned. If you live in Georgia - PLEASE READ. There is a house resolution before the Rules Committee in our state.. I’ve been busy contacting our state representatives. I am asking you to do the same because the more people they hear from – the larger the impact will be and the better the possibility for us to have this put up for a vote. Please read for information on how YOU can help. This is VERY important to me and many other families in this state. 2) Copy the following email addresses and then paste them into the BCC section of your email. I’m contacting you to encourage and ask you to support HR 1341, the House Resolution for a Joint Study Committee of Direct-Entry Midwives, and move it out of Rules and onto the calendar for a vote. Please understand that you are not voting to necessarily “recommend” homebirth itself – only to move it to the next phase for study. 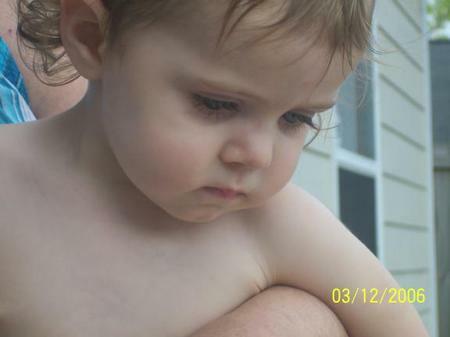 This topic and birth option matters to MANY Georgia families. 4) Include your name and the city where you live. 5) If you want to say that your daughter/son (or someone that you know) had a homebirth – it’s ok but not necessary. This is the 3rd or 4th time that a bill such as this has made it this far. Previously it has died in this phase. Please help us prevent that from happening again. No matter what your opinion or beliefs about birth, I’m asking for your help on this matter because we need to get this study going to get all the facts out there so that this matter can be decided upon. With a licensing policy in place, there can be certification and training which will guarantee women safe and equal access to prenatal/birth care. Twenty four states in our country and the entire country of Canada and most all of Europe have such a policy already in place. All of these countries have BETTER neonatal outcomes than the USA and the majority of that is because of ready access to midwives. We aren’t trying to take business away from hospitals or obstetricians. We are trying to provide a legal option for the 10-15% of families who prefer to birth in birthing centers (currently GA only has one in Rincon, GA ) and in the safety of their home. Having legislation and a licensing program in place will benefit MANY families in this state. Ultimately babies will win. This is one of many ways that the circus of birth can be calmed and repaired. It can start with you today by helping us contact legislators. Our legislators think that Certified Professional Midwives don’t matter in this state – PLEASE help us show them that it does. You can further assist this matter by passing this information onto anyone and everyone that you know who could/would help us contact our legislators. What I’m asking you to do will take less than 5 minutes and the impact could last a lifetime. This spring when you purchase mulch from your supplier - make sure that you know where it came from. I would recommend that it be purchased not from a man off the street who has a great low price - but from a reputable authorized dealer who can verify the supplier that they got it from. There's an email circulating around (I've gotten it a few times already) which is saying that State Farm is saying not to buy mulch from Home*Depot or *Lowes but I can't find that statement anywhere on any of their web sites. I did find a good bit of very helpful information on the LSU website in the agriculture department. Evidently - heating the mulch to a certain temperature will kill any infestation of any kinds of bugs - including termites and the package has to clarify if the mulch has been cured. I guess it just pays to be careful no matter where you are or where you are purchasing mulch from. One solution would be to purchase "rubber mulch" and then you wouldn't have to worry about termites, would you? One thought that I have is.....who would want blue mulch in their yard?